Web exclusive! Feeling under the weather? 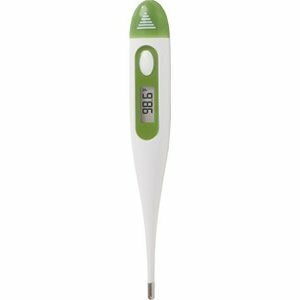 The Dual Scale 60-Second Digital Thermometer with Beeper, Memory and Fever Alarm is the perfect tool to get back on track towards feeling better. This thermometer provides 60-second readouts and has last-reading memory recall to monitor your progress. It also has a low-battery indicator to let you know when it needs a power-up. 7.44" x 0.81" x 2.25"
If you have any questions about this product by Veridian Healthcare, contact us by completing and submitting the form below. If you are looking for a specif part number, please include it with your message.